tl;dr – If you don’t mind paying, FFXIV is hard to beat for story, group content, and epic boss fights. Final Fantasy XIV: A Realm Reborn is an MMORPG developed and published by Square Enix. It is a complete remake of the badly received Final Fantasy XIV released in early 2010. First released on August 27, 2013, FFXIV: ARR is available for Windows, PS3, PS4, and Mac OSX. Square Enix’s second Final Fantasy MMORPG is reviewed based on base content without the Heavensward expansion. Final Fantasy is arguably most well known RPG series around. So it’s no wonder that an MMO from the series (well, the second MMO from the series) would garner a lot of attention. Unfortunately, the first version of the game wasn’t well received. It was plagued with poor UI and full of nonsensical restrictions like limiting play time. Eventually Square Enix decided to remake Final Fantasy XIV with a new engine to support improvements deemed necessary for overall gameplay. A Realm Reborn shares plenty of mechanics with the originally released Final Fantasy XIV though. In that sense, one can think of FFXIV: ARR as a majorly upgraded version of the MMORPG. The deep and well told story is set 5 years after the events of the original FFXIV, set in a world in the midst of rebuilding from the devastation. 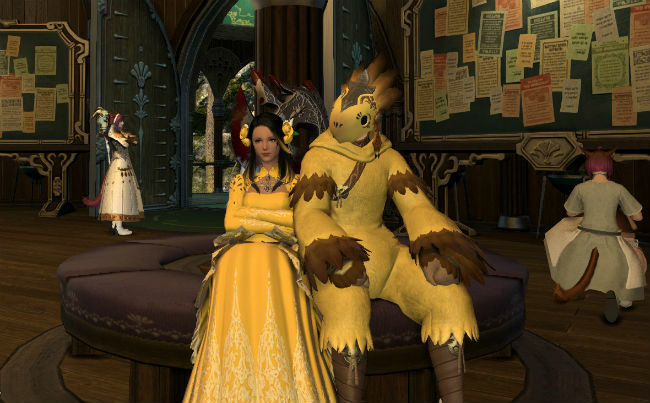 Lore and story progression is a huge component of Final Fantasy XIV. In fact one must finish the main quest’s storyline before playing the expansion content. This game features six playable races: the elf-like Elezen, the human Hyur, the dwarfish Lalafell, the kemonomimi Miqo’te, the giant-like Roegadyn, and the horned Au Ra. Furthermore, each race is subdivided into two clans each. The races and clans in this game are mostly cosmetic, the only thing that differs gameplay-wise are their starting stat points. Every race and clan can access all class and jobs. Yes, classes and jobs. Unlike most MMO where those two are one and the same, in FF14 classes and jobs are different from one another. Classes are well, classes and refer to the standard professions you can pick. These are divided into four disciples. Disciples of War house the combat classes, Disciples of Magic the magic-based classes, Disciples of the Hand the crafting classes, and Disciples of the Land the resource gathering classes. All in all, there are 20 classes in the game and unlike most MMOs, you can take all the classes in one character. Since a single character can have all the classes, everyone would end up the same during endgame. To combat this, Square Enix added the jobs system. Jobs are an extension of the class system, allowing for a deeper specialization. Each job requires a particular primary class at level 30, and another class at level 15. To give you an example, the Ninja job requires you to be at least a level 30 Rogue and a level 15 Pugilist. The job takes over the primary class, and can use all its abilities and traits, so if you’re a level 42 Rogue and became a Ninja, you will become a level 42, Ninja. Subsequently, if you leveled up your ninja to 44 and then unequipped your job, you will revert to a level 44 Rouge. FF14 doesn’t use skill points or a skill tree. Skills in this game are divided into two types, actions, and traits. To be short, actions are active skills while traits are passive skills. Also, while this game is made for multi-classing, it doesn’t mean that you can use all the skills of all classes. As a general rule, you can only use your primary class’ skills during battle. But each class/job has a list Cross-Class actions that you can equip to your cross-class slot and allows you to use that skill. As an example, if you’re a Gladiator you can use the Pugilist actions’ Featherfoot, Second Wind, Haymaker, Internal Release and Mantra. Fair warning: the good section is much longer than the bed for this Final Fantasy XIV review. For one, the story is great. It is engrossing and makes you want to learn more. Unlike most MMORPGs with forgettable quest lines and characters, the game earns its Final Fantasy name from just the story alone. The Lore is extremely well developed, and everything has a place in the game world. It makes for an environment that feels more like a true alternate, virtual world and less like a loot grinding game. The class/job system is also excellent. You don’t need to create multiple alts just to experience every aspect of this game. Also, all the classes/jobs are well developed and occupy a certain niche. The way that classes level up gives encouragement to revisit old content. Additionally, leveling up twenty classes would provide a ton of content and many options for multi-class abilities. Although combat is a standard hotbar affair, the way that players must use their abilities encourage a hefty dose of strategy and smart gameplay. Certain abilities will work better against certain mob groups. There’s a good amount of resource limitations with Final Fantasy XIV encounters too. It’s not so much a faceroll hotbar combat MMORPG like many of its competitors. Group combat is excellent in this game and fortunately, so is the community. Finally, the graphics are stunning. Every class/job has a different appearance. Every monster feels special. And every map looks different. There are no copy pasted environments here. It’s actually challenging coming up for negatives when reviewing Final Fantasy XIV. One though is that FFXI requires a subscription. Arguably this is a positive as the community is better than most of the other free to play communities I’ve found. But it is noteworthy that in an age of free to play MMOs, this one will cost you money each month. If the story doesn’t draw you in or you don’t care about stories in your MMORPG then FFXIV: ARR will feel really grindy. It takes a while to get level up, especially when multiple classes are added to the mix. There’s a lot of solo content for players, but group content is where combat shines. As such, leveling can be really boring at times. There’s not enough incentive to group up outside of dungeons. Final Fantasy XIV earns high marks for its story, group combat, multi-class job system is a great MMO game that deserves the Final Fantasy series name. It has a good story, stunning visuals and a well-developed class system that doesn’t put the FF name to shame. In the end, I recommend this to everyone that can spare the subscription fees.